MSE Rollerforks Push-Pull Attachment | GCA Equipment Inc.
A new push-pull concept made up of two separate units which are hydraulically in unison extended using the Equaliser System principle. 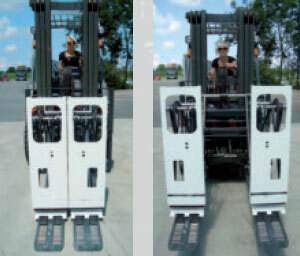 The system can be equipped with regular fork platens or RollerForks®. Saving time with a revolutionary combination. 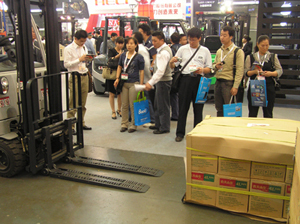 Palletless handling. Save time, space and money. Using the unique ROLLER Push-Pull combination, it is now possible to load and unload containers and/or trailers with loads stacked on top of one another faster than ever before. 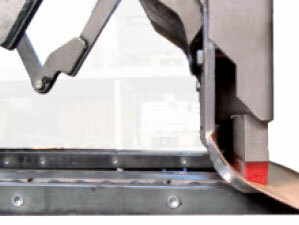 ROLLERFORKS® are ideal for lifting loads stacked directly on the floor because the floor acts as a fixed reference point for turning the rollers. 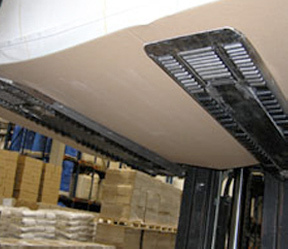 If loads are not stacked directly on the floor, e.g. two-high, then the push-pull mechanism can be used. As soon as the load has been manoeuvred onto the ROLLERFORKS®, it can be easily transferred onto an in-house pallet using the ROLLERFORKS®. This method saves a lot of time because the push-pull mechanism does not have to be extended or retracted. One piece fork or carriage mounted MSE push-pull attachments are also available.